This post was first published a couple of months ago. Now when you read the title of this post you might think I am talking about the World Champion Golden State Warriors. 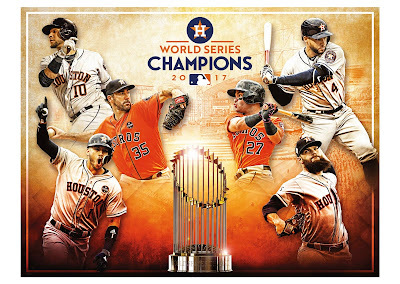 No, I am not talking about the back to back NBA Champions, but I am talking about the MLB World Champion Houston Astros. In baseball there is well known and stated truism that in order to be a good baseball team you must be able to split your games on the road [i.e., play .500 baseball] and have a good winning record at home. You do those two things and you will be at least in the race to make the playoffs [winning division or wild card]. The last couple of years there have been some great teams that not only win at home but also play great baseball on the road. But no one has been better on the road the last two years than the 2017 World Champion Houston Astros. Just check out these stats from the 2017 season until this past weekend's games of all MLB teams on the road, and look at not just who is leading in every category but check out the difference between the Astros and every other MLB team. Note: these stats are before the Astros 4 game sweep of the Texas Rangers over the weekend. The 2017, 2018 Houston Astros are indeed "road warriors". UPDATE (June 18, 2018): I wrote this one day into the Astros 10 game road trip which they swept. So, now the Astros record in 2017-2018, on the road, is an incredible 82-39. This means the last year and a half (MLB seasons) the Astros are playing .678 baseball ... on the road! UPDATE (June 28, 2018): With the Astros tonight [June 28] winning their 11th straight game on the road, the Astros TV announcers gave an amazing stat on the post game show. The Astros run differential "on the road" is now +129. The closest team to them in MLB is the Chicago Cubs at +55. UPDATE: (Sept. 12, 2018): With the season in the stretch run, the Astros continue to hold on to the title as "the road warriors", as with their win today [Sept. 12] over the Detroit Tigers, they now have the most wins on the road in a two year stretch in MLB history. And there are still 7 games to go to add on to the wins. UPDATE: (Sept. 30, 2018): The regular 2018 MLB season just ending today it is now official that the Houston Astros have set a record for the most wins on the road in a two season period in history, 110. Two years on the road would be equivalent to a Major League Baseball season of 162 games...so, it would be like winning 110 games in a season...and this was on the road. To put it another way, the Houston Astros for the 2017-2018 seasons played at a .679 clip on the road.